Education provides the building blocks for the development and progression of society, enabling every child the opportunity to realise their potential and contribute towards a more sustainable and fulfilling future. 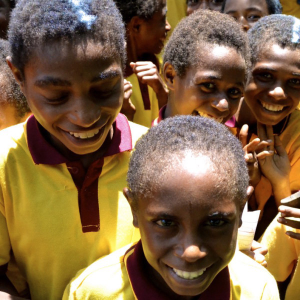 Unfortunately, with an estimated 600,000 school-aged children currently out of school, education in Papua New Guinea (PNG) is not afforded to every person and community. Underpinning this deficiency is the lack of qualified teachers, including the large cohort of partially-trained teachers across PNG who began their training at some stage over the past two decades, but were never given the opportunity to complete their training. In 2016, the PNG National Department of Education decided to cease their multi-year, mixed-mode, outreach training format for the training of new elementary teachers, causing teachers who were partially trained under the “old system” to lose their opportunity to complete their training and become certified. 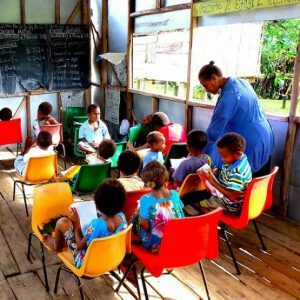 There were 7,000 partially-trained teachers across PNG, 75% of whom received no pay and 25% of whom received small allowances. If they continued in these roles, they had to undertake an additional six-week training course and complete their certification immediately. Kokoda Track Foundation (KTF) – an Australian aid organisation that works with people and communities to improve the lives and futures of Papua New Guineans – decided that they couldn’t stand by and watch thousands of teachers be exited from the system; however, they had a small window to act. If these teachers did not complete their training, they would be unable to upgrade their current qualifications and would never receive a full Government salary. Their only option to remain in the profession was to re-train via the new 40-week program rolled out across the country from 2017-18, and entry to this program is competitive, limited and extremely expensive – out of reach for the large majority of the cohort of partially-trained elementary teachers. PNG could not afford to lose 7,000 teachers from the teaching profession, and so KTF’s Teach for Tomorrow program was established, which aimed to complete the training of all partially-trained teachers across the country in order to have a long-term impact on improved student outcomes and increased access to educational services in rural and remote communities. The program trained a large cohort of elementary teachers and provided them with the qualifications to teach Preparatory, Grade 1 and Grade 2 in remote communities across PNG. The design of the Teach for Tomorrow project was undertaken in close consultation with local communities; elementary teachers (partially and fully trained); provincial education authorities; the National Department of Education; the PNG Education Institute; and an expert working group. The proactive response of KTF was supported by a range of corporate partners including Newcrest Mining Limited, ExxonMobil, Steamships, Flight Centre, Bougainville Copper Limited and the Australian and PNG Governments. The program also led to the establishment of a longer-term, follow-up program, Teach for Tomorrow II, which provides graduates with ongoing professional development and mentoring, with key support provided in child protection, gender equity and inclusive education. This development also involved working with teachers and their students to make culturally appropriate books and resources for use in extremely remote schools. Having access to highly trained teachers ensures children from remote villages receive a valuable education and are encouraged to stay in school. This is particularly relevant, given the expected years of schooling in PNG is 9.9 years, less than half of the 20.4 years expected in Australia – and less than 2% of children who begin Grade 1 in PNG go on to complete Grade 12. The graduate teachers in almost all cases return to their home villages to operate remote elementary schools. The flow-on effects of such assistance cannot be overstated – with every teacher lies a changemaker with the capacity to transform the lives of PNG children. Had it not been for KTF’s work, thousands of teachers would have exited from the teaching profession, having a catastrophic consequence on education service delivery in PNG. The assistance KTF has provided and is continuing to provide will undoubtedly have a significant positive impact on PNG’s future for generations to come.